Sometimes greatness can be seen in an instant, like the “shake and bake” spin move that Earl Monroe used to break down an opponent just before he drained a jumper. Sometimes it happens over a season, like seeing “The Pearl” drop 40, 45, even 50 points game after game after game. Sometimes, greatness is in a career, a championship season, a life. I saw greatness in 1967. The Green Bay Packers beat the Kansas City Chiefs in the first Super Bowl. Muhammad Ali refused to go fight in Vietnam. The U.S. Supreme Court ruled in Loving v. Virginia that bans on interracial marriage were unconstitutional. And the Winston-Salem State College Rams won the NCAA College Division title, beating Southwest Missouri State 77-74, becoming the first team from a historically black college or university (HBCU) to win an NCAA championship in any sport. 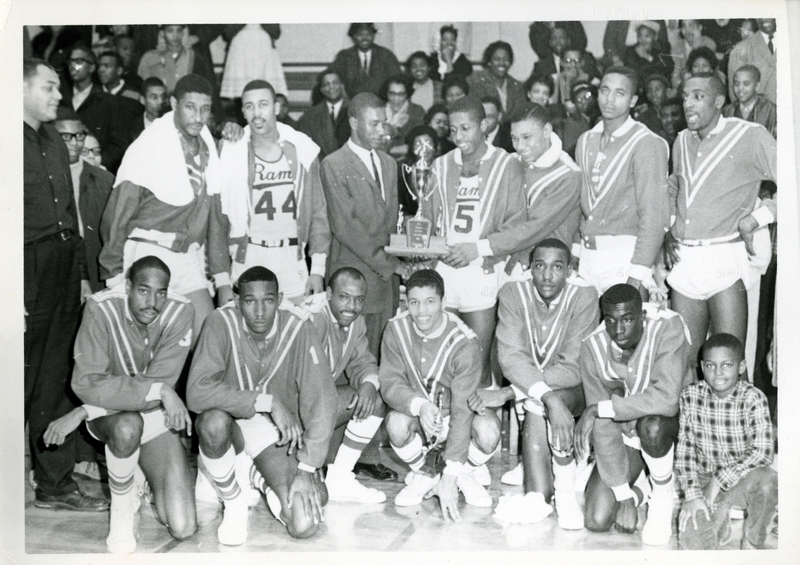 The 1967 Winston-Salem State Rams after accepting the NCAA College Division Championship trophy. As a 12-year-old, I didn’t know about most of those things. All I knew was that I was growing up watching one of the greatest coaches and greatest ballplayers of all time. Practice after practice, game after game, I had a front row seat at the end of the bench as a ball boy at Whitaker Gymnasium, the Rams’ home court. America’s South wasn’t integrated. Far from it. In his book, They Call Me Big House, legendary coach Clarence “Big House” Gaines and author Clint Johnson described how white fans started to flock to Winston-Salem State games to see Monroe, the future No. 2 overall NBA draft pick and Hall of Famer. As Monroe’s exploits grew, so did attendance. The games were moved out of Whitaker to the larger Winston-Salem Memorial Coliseum. That 1967 NCAA title team, which was just enshrined into the Central Intercollegiate Athletic Association (CIAA) Hall of Fame, included young men from New Jersey, New York, Philadelphia, and North and South Carolina. Some had been balling with white players most of their lives in the urban North. Others had never played against a white player until they participated in scrimmages against Wake Forest University that were set up by former Demon Deacons player and coach Billy Packer. The players had to not only live with each other but do so in the radicalized world of the Jim Crow South, which few had experienced. Gaines had to school them about both basketball and life. From left, Eugene Smiley, Earl Monroe, Brent Cromwell and Donald Williams after their induction into the CIAA Hall of Fame. Monroe tells a story about a time the team was traveling in a station wagon and got pulled over by a white state trooper. When the officer got to the car and looked in, Gaines got out. Ernest Browne was born and raised in the Bronx and had never been to the South. He traveled South by train in 1966 for the first time to attend Winston-Salem State and nearly got arrested in Richmond, Virginia, because he refused to move after a white conductor told him to. While playing against white players was routine for Browne, Monroe and Eugene Smiley, who grew up in the Northeast, teammate Allen McManus, a freshman on the title team, had grown up in Charlotte, North Carolina, and never played against white athletes in high school. Teammate Jim Reid had a similar experience. Their first experience playing against whites was in those scrimmages against Wake Forest. The Rams’ championship mettle was forged in daily practices that made games easier than drills and scrimmages in the shoebox-sized Whitaker Gymnasium. But the basketball drills were not the toughest part of practice. It was the rope-climbing. Gaines knew his players had to score consistently; that’s why he mostly recruited ball handlers and shooters — dating to his previous all-world players: first-round NBA draft selection Cleo Hill and two-time All-CIAA guards Jack DeFares and Ted Blunt. Gaines would have players shoot as much as they wanted, either jump shots or layups. When they missed, they had to climb the ropes to the top of the gym. No one was exempt. If you missed, you hit the ropes. My dad, “Coach X” (for Xavier), one of Gaines’ assistant coaches, made sure the players completed the task. Monroe was confident enough to shoot jumpers until he got tired. Bill English, who holds Winston-State’s single-game scoring record of 77 points, was also smart enough to know when to start shooting layups. But others, like McManus, had to learn. “All I did was shoot. But if you missed a shot, you go to the ropes. I developed huge shoulders going those ropes.” He also developed into a team captain and MVP of the 1970 CIAA title team. Gaines had a stellar 1966 recruiting class that included McManus, Vaughn Kimbrough, John Lathan, Frank Hadley and Donald Williams, who would go on to win the 1970 CIAA championship, one of Gaines’ eight CIAA titles. Gaines coached the Rams from 1946 to 1993, compiling an 828-447 record in 47 seasons. He led them to 18 20-win seasons. He and Monroe are in the Naismith Basketball Hall of Fame as well as the College Basketball Hall of Fame. 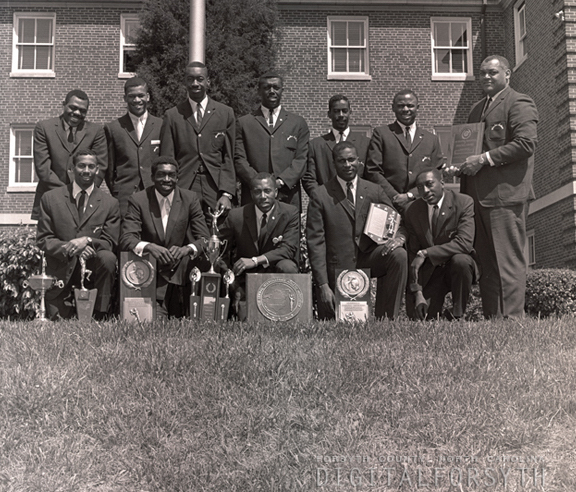 The 1967 team with their trophies: First row, left to right: Brent Cromwell, Earl Monroe, Steve Smith (Sahib Abdul Kharir), John Watkins and Eugene Smiley. Second row, left to right: Ernest Browne, John Michael, John Latham, Bill English, David Green, Vaughn Kimbrough, coach Clarence “Big House” Gaines. In the ’67 championship season, the Rams lost only one game, finishing 31-1, with Monroe gaining first-team All-American honors from The Associated Press, UPI and the Sporting News, which was the most important because it was chosen by NBA general managers and scouts. That first team included Lew Alcindor, Elvin Hayes, Jimmy Walker and Sonny Dove. 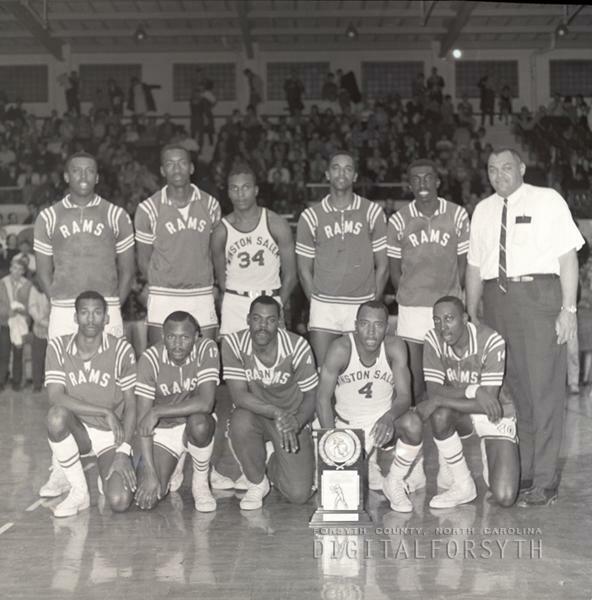 The championship bond was forged during the 1966 season when the Rams won Big House’s second CIAA title, beating Virginia Union for the first time that season. That win put the Rams into the NCAA tournament for the first time. Previously, they had gone to postseason play in the National Association of Intercollegiate Athletics (NAIA), which admitted HBCU teams before the NCAA. The Rams had reached the NAIA quarterfinals twice and the first and second rounds once each. Yet, when the team lost a game to a CIAA rival in 1966, there was criticism on campus that caught the attention of Big House and the players. Gaines called a team meeting. After that meeting, the practices got tougher. “Those practices sent a message that we were going to be better than the other team,” Monroe recalled. “We lost a game my junior year in Winston-Salem (to Norfolk State). We were winning all during the year, and we lost that game. It seemed like the campus people were down on us. Coach called us together and really explained to us that people are going to be who they are but we’re together, it’s us. And that’s where we got this thing, it’s us against the world. It manifested itself into the next year,” said Monroe, who averaged nearly 42 points a game and was the most outstanding player in the NCAA College Division tournament in 1967. 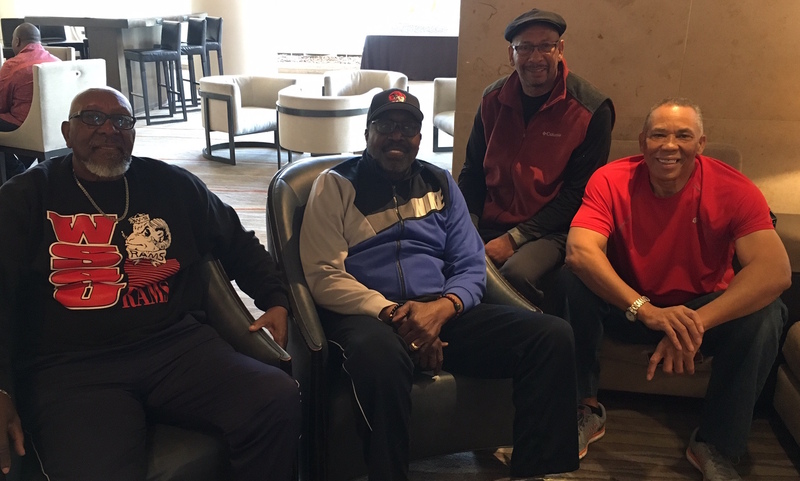 Another reason for the bond was that most of the team members belong to the social fraternity Groove Phi Groove, which was started at Gaines’ alma mater, Morgan State College, in 1962. Most of the teammates became members during their playing careers. Donald Williams was a freshman from Washington, D.C., who had been recruited by Gaines after playing pickup games with Monroe and others on campus during a summer campus visit. Immediately, he said, the bond that the upperclassmen had forged was apparent, and as a newcomer it was easy to buy into the program. “We saw they had a love for each other. When you saw one upperclassman, you saw all of them, the fellowship and camaraderie they had,” said Williams, who was the versatile sixth man on the title team. Plus, he said Gaines’ principled yet stern approach taught players life skills that would serve them well throughout their life. He reminded them they were student-athletes first. Smiley, who was from Newark, New Jersey, was a starter on the championship team. He came to Winston-Salem State as a sophomore after attending another college his freshman year. He said that even though the bond was forged in the 1966 season and into the ’67 campaign, it was Monroe’s leadership that pulled them through. Brent Cromwell, who joined the team at midseason after another player became ineligible, said Gaines challenged players in unique ways, with phrases and insights about life in general. As a gym rat, I was afraid of Big House. At 6 feet, 3 inches and well over 275 pounds, I could see where he got his nickname. He intimidated most everyone, except, I think, my father. 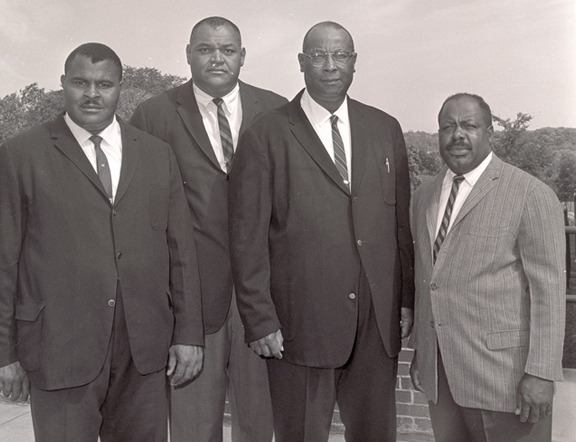 From left: Winston-Salem State College basketball coaches: Cleo Wallace, Clarence “Big House” Gaines, Thomas Conrad and John X. Miller Sr.
John X. Miller Sr. was an assistant in basketball and football but head coach at one time or another in track and field and tennis. Players and students called my dad “Big Red” or Coach X. He was the good cop to Gaines’ bad cop. In talking to the ’67 players, I learned things about my dad I never knew, in part because he died in 1971 when I was 15. As a coach’s kid, I was always in the gym, traveling with one of his teams, seeing black sports excellence in ways I relish to this day. When my father died, I only understood how he affected my life. Now I see more plainly how he touched those outside my family. In the late 1950s through early 1970s, the CIAA was an 18-school conference where the best black college sports were played. It’s the oldest African-American conference, and at its zenith it included Howard, North Carolina A&T, Morgan State, Norfolk State, Hampton Institute, West Virginia State and North Carolina Central. These schools produced athletes that integrated the NBA, NFL, track and field, and tennis. My dad coached Leon Coleman, a 110-meter hurdler who finished in fourth place at the “Black Power” Olympics in 1968 at Mexico City. He remains the school’s only Olympian. On two levels, with the Rams’ basketball program and with Coleman, I witnessed greatness firsthand: the dedication, athleticism, work ethic and focus that it takes to build champions. Last week, as players told me stories about my father, I saw another side of greatness. They told me how he’d console players with jokes after they’d been cut from the team. Or how he’d give them a break on climbing the ropes after missing too many shots in practice. Or how he’d perfected a certain way to point them to the door when it was time for them to leave for the showers, class or the library. He was the coach who handed out uniforms before games. He became a sign of joy: When Coach X gave freshman McManus his uniform for the first time, it was the happiest moment of McManus’ life. Or a harbinger of disappointment, when he came to practice with a broom to sweep those who’d been cut from the team off the floor. The 1963-64 team won an early-season Georgia Invitational Tournament. Kneeling, left to right: Ted Ratchford, Joe Cunningham, Charlie Simmons, Ted Blount, Willis Bennett, Earl Monroe and me, the ball boy, John X. Miller Jr. Standing, left to right: Coach “Big House” Gaines, Louis Parker, Richard Glover, unidentified tournament official, Willie Curry, Richard Smith, James Reid and Gilbert Smith. My two sisters, Linnell and Yvette, and I learned vicariously from how he treated his students and athletes. Besides coaching, he was a physical education instructor at Winston-State, teaching students who wanted degrees in teaching physical and health education. Though I didn’t know it at the time, he was training me up to coach, not on an athletic pitch, but in a newsroom, where I love to mentor, teach and prepare the next generations of journalists. He taught me to love sports’ competitive nature, to grasp the intricacies of any game, to appreciate the talent and fierceness to win. He also taught me the capriciousness of sports and the need for life plans beyond sports. That’s why I chose an academic scholarship to Washington and Lee University instead of one in football, a career as a sports journalist and editor, rather than one as an athlete. Years later, after his death, his former students would tell us how they loved him. They wanted to share their stories with me, as Monroe, Williams, McManus, Browne and others did last weekend. Those stories reminded me of the days when I ran the halls, classrooms and locker rooms of Whitaker Gymnasium, picking up towels, chasing down basketballs and standing in awe of greatness. That bond the players forged among themselves and with Gaines was not just between them; it was also with me. As I listened to the stories about my father, in some ways a father I never knew, I grew closer to him. I was a little boy again, excited about being close to him. And as they remain true to their old fellowship, I now have new friends and memories of a championship, and of my champion. Sometimes, greatness is in a championship season, a career and a life.